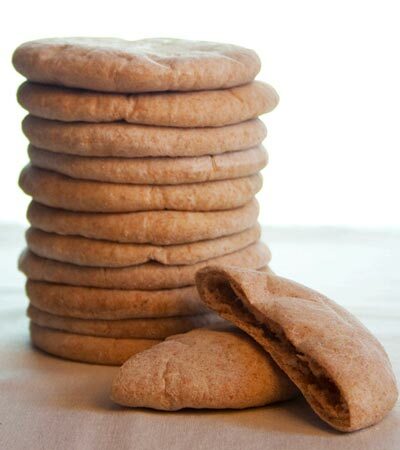 Homemade pita bread is so much better than store bought, which doesn't have much of a texture and is flavorless to boot. Once I made my first batch and I realized how easy they are to make, I could never go back. I was a little intimidated at first, thinking there must be some complicated trick to make the center of the rounds hollow. But it really is like magic and watching them puff up like a balloon in the oven never gets old. These are perfect to make in the winter cause it gives you an excuse to stand by the stove. Want to know what others thought about this recipe? Would you like to comment on this recipe? Go to the Whole Wheat Pita Bread blog entry. In a large mixing bowl place water, sugar and yeast and mix it together and let sit for 10 minutes. After the 10 minutes are up you should see the yeast come to life. It will look like wheat foam on top of the water. You will probably even see it bubble. Next we add the olive oil and all purpose flour. Mix this together and then add the salt. We don't want to add the salt before we add some of the flour because it could kill the active yeast. Now add the whole wheat flour and mix and knead with your hands for about 3 minutes. You can do this part in a Kitchen Aid mixer with a dough hook but your hands work just fine. 1. First grab a blob of dough and measure the weight on a kitchen scale, subtract or add dough until you get a 2-oz. blob. 2. Kneed the blob together and then squeeze it from the bottom and push upwards with one finger. This will form a perfect rounded top. 3. We have the top looking good, now we work on sealing up the bottom by pinching and kneading until it appears smoother. 4. Then you punch and press the bottom with your finger to get it even smoother. 5. Now pace the bottom of your hands together, cupping the dough ball and pressing on the bottom to make it round. You should have formed a perfect sphere. 6. Place this on a cookie sheet sprayed or wiped with a little oil. Do this until you have all 16 dough balls finished and on the cookie sheet. Cover this with a tea towel or plastic wrap and let rest for 20 minutes. 7. Next we preheat your oven to 425 degrees. Place an upside down cookie sheet in the middle of the oven while you're at it, this is what we will bake the pitas on. Now place a sheet of parchment down on your work surface and lightly flour it. Place a dough ball down and press it down in the center to form a puck. Turn this over and place the top on some flour to lightly flour the other side. 8. With a small rolling pin roll the puck into a 5 inch round. 9. Do 2 and place them on the cookie sheet in the oven. 10. These cook fast. Watch as they magically puff up in the oven. They are done in 4 to 5 minutes. Use tongs to grab them out of the oven. It's a good idea to have 2 more rounds ready for the oven while 2 bake. After you have them out of the oven keep them covered with foil wrap and let them cool for at least an hour before you cut them in half. 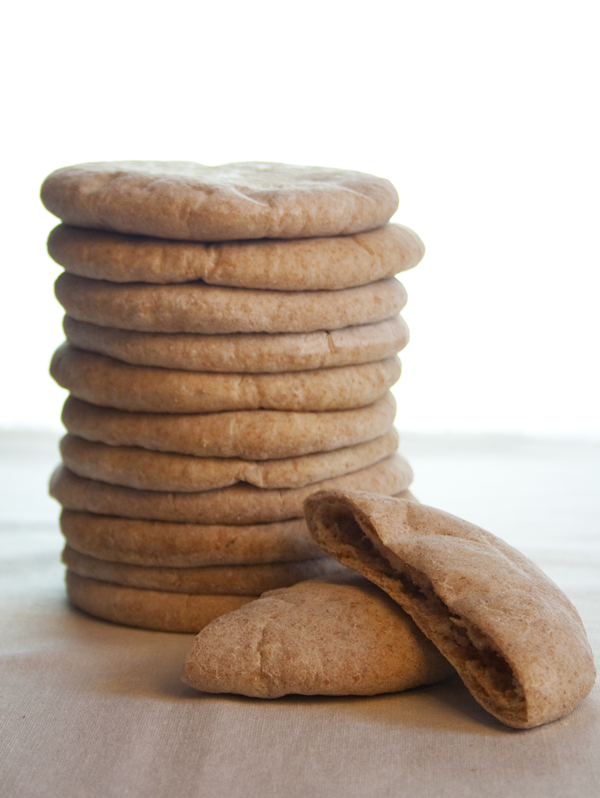 Serve them with my Low Fat Hummus recipe or Pan Bagnat salad recipe. These can be frozen and keep for months.